The treadmill was not originally designed to be one of the greatest exercise machines of all time. From its original purposes, including churning butter and punishing convicts, no one could have foreseen it would become the king of all aerobic equipment. How did the modern treadmill wheel its way into the fitness world’s collective psyche? Let’s take a step back in time and trace the origins of the treadmill. In the late 1st century AD, the Romans came up with the Polyspastos Crane. This machine enabled four workers to lift 3000 kg using a winch on each side. Roman engineers then fitted the crane with a human powered “tread wheel”, which enabled the crane to lift twice as much weight (6000 kg) using half the crew. The treadwheel was placed vertically on the side of the crane, resembling a hamster wheel, and one crane operator would climb around inside the wheel to power the crane utilising a vertical crawl. The human powered treadwheel crane was used up until the 1900s, with some designs wide enough to fit two people, doubling the effective power of the treadwheel. Some cranes even had two treadmills in one axle, making the treadwheel crane four times more powerful. Treadmills were used on farms and in mills way before powered machines running on fossil fuels came into play. Back then it was human power or animal power. When farmers needed to churn butter, grind grain, pump water or knead some dough, they used “tread wheels” which were really nothing more than a wheel rotating on an axle. The wheel could either be installed vertically (like a waterwheel) or horizontally on a slight incline. Many variations of this device were made in the early 1800s. 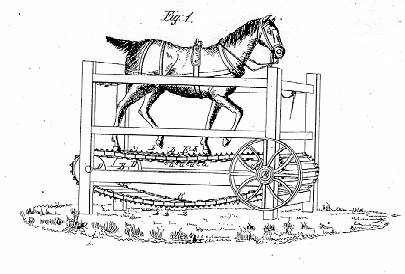 When farmers got tired of waiting for the wind or the water to power their mills to grind grain or pump water, they used farm animals such as horses, goats, sheep and even dogs to power treadmills of all sizes. These treadmills were housed in an enclosure with an inclined tread as a floor for the animals to walk on, similar to the manual treadmills we have today. Even before making its way into your living room, the treadmill was used in British prisons as a cruel and unusual form of punishment. In 1818 Englishman and engineer Sir William Cubitt proposed using the convicts’ muscle power to simultaneously ‘cure’ their idleness and produce useful work. Being the son of a miller, Cubitt was familiar with how treadmills worked, and basing his designs on what he knew about farm treadmills, the ‘Everlasting Staircase‘ was born. Rotating on a horizontal axis, Cubitt’s treadmills resembled a wide, foreboding staircase. Prisoners were forced to ‘climb’ the steps or spokes of this machine for six straight hours or more to pump water, grind grain or just for the punishment. To the prisoners, it wasn’t the 6,600 or more steps – the equivalent of climbing 17,000 vertical feet – that was the worst bit of this form of punishment. It was the “monotonous steadiness” of the task that was enough to drive some of them to revolt. The prison treadmill gained notoriety for its cruelty and was often criticised, but it wasn’t until The Prisons Act of 1898 that its use was finally abolished. The roaring 20s was the “Era of Wonderful Nonsense” and was a time for the rich people to party and consume profuse amounts of illegal alcohol. When the rich wanted to get fit without leaving the room, they had dog treadmills custom fitted for human use. By the looks of it, these were probably just for show (or slow walking) as you would have a hard time running on the wooden slats. The treadmill designs of the 30s improved a bit, but overall they weren’t much better. Set on a permanent incline and with no motor, the wooden slats were replaced with tough and durable fabric. The incline, and the fact that there isn’t any motor that runs the belt, is harder on the joints because more power is needed to generate momentum, just like the manual treadmills we have today. These things were expensive and only the rich could afford them. The next leg of our journey takes us to the University of Washington in 1952, when internationally recognised cardiologist Dr. Robert A. Bruce and his colleague Wayne Quinton invented the medical treadmill to help diagnose heart and lung diseases. In the 50s, there wasn’t a safe way to test and monitor cardiac function in exercising patients, so Dr. Bruce came up with the bright idea of hooking up patients to an ECG and letting them run on a treadmill, paving the way for the modern day stress test. Today, medical treadmills are used in hospitals, rehabilitation centres and physical therapy clinics all over the world. In 1968, mechanical engineer and fitness pioneer William Staub designed and invented the first treadmill meant for home use after reading a book on the benefits of exercise titled “Aerobics” by Dr. Kenneth H. Cooper. The book outlined the health benefits of regular running, which noted that people who ran for eight minutes a day, 5 times a week were in better shape than sedentary individuals. The treadmill was called the PaceMaster 600. Bill Staub noticed that there weren’t any available (and affordable) treadmills for commercial use at the time, so he made his own. He sent a prototype to Dr. Cooper, who thought the invention was great and helped him fund it through his own company, Aerobics, Inc.
Dr. Cooper also helped market and land Mr. Staub’s first customers. Staub’s invention revolutionized the fitness industry and paved the way for many of the fitness machine innovations we use and enjoy today. It also opened the minds of many people about the health benefits of running. Today, you can find treadmills in homes and fitness centres around world. These range from the cheap, lightweight treadmills that are sometimes too small and rickety to do any real running, to the big and expensive treadmills that have all the bells and whistles including iPod connectivity, an LCD monitor, built in speakers, a heart rate monitor and enough settings to make the late Bill Staub beam with pride. Still, manufacturers are always willing to push the envelope on treadmill evolution. The basics will always remain the same, but the add ons are getting insanely spectacular. There’s now a treadmill for geeks too busy to leave their desks called the Workstation Treadmill (or Treadmill Desk). Your desk will have a treadmill instead of a chair, and you need to walk while working. There are a few negatives to this kind of treadmill though, so please do some research before getting one. There’s also a Hydro Treadmill, which allows runners to submerge half their bodies in water while running on a treadmill. If you want to just run everywhere, you can use the Treadmill Bike, which is basically a treadmill attached to a frame with two wheels. It looks like a bike, but instead of pedalling for power, you’ll be running on a belt. Finally, there’s a treadmill that’s about to be released meant to work with virtual reality technology. Made specifically with gamers in mind, the Virtuix Omni VR Treadmill will work with any compatible game and will allow you to walk, jump and run in any direction, all in the virtual world. Imagine playing a game with zombies or dinosaurs. I can’t wait for this tech to be available! The invention of the modern day treadmill has helped millions of people get in shape and stay healthy all year round, regardless of the weather outside. So the next time the weather turns sour and you want to go for a run, you can say thanks to the Romans, Sir Cubitt, Mr. Staub, Dr. Bruce and Dr. Cooper for inventing and developing one of the greatest exercise machines of all time, the Treadmill.